The almighty dollar is struggling. The currency has lost 10 percent of its value so far in 2017, marking its worst start to a year since 2002. Although currency fluctuations are inevitable, the dollar is now falling in the context of market conditions that are historically associated with an increase in value. Geopolitical tensions, such as the ongoing military standoff with North Korea, usually see markets rushing to support safe-haven currencies like the dollar. The fact that the US is involved in much of the ongoing international friction may be reason enough to undermine these historical norms, but other factors are also at work. Current monetary policy at the US Federal Reserve would also traditionally be seen as supportive of a strong currency. Interest rate rises and the announcement that the Federal Reserve will start to reduce its balance sheet would normally see the dollar increase in value. These are not normal times, however, and the evidence suggests that currency markets did not envisage the impact of the new US president. Donald Trump’s surprise election win saw the dollar surge following campaign promises of substantial economic reform. However, proposed tax breaks for businesses and infrastructural spending have not materialised, with the Trump administration facing sustained resistance in Congress. And, as the market’s confidence in Trump’s economic policies has dwindled, so has support for the dollar. In addition, Trump’s provocative rhetoric is only fanning the flames of economic uncertainty. Threatening to unleash “fire and fury” or shut down the government does not inspire market confidence. “The decline in the dollar is at least partly attributable to growing concerns about political risk for the US, with the failure of healthcare legislation, the possibility of a budget standoff and, most recently, further political uncertainty following the Charlottesville events,” explained William Cline, Senior Fellow at the Peterson Institute for International Economics. On the other side of the coin is the bullish performance of the euro, which is exacerbating the dollar’s decline. “The larger move against the euro reflects considerable improvement in political risk in the eurozone, given the outcome of the French elections and the easing of concerns about Italian banks, as well as an improved growth outlook in Europe,” Cline added. However, the dollar has also fallen by more than seven percent this year against the yen, by 14 percent against the Mexican peso, and by 13 percent against the Swedish krona. Independent of the euro, a clear trend is emerging whereby value is moving away from the dollar. Putting aside any assessment of his popularity levels, Trump is right to suggest that a strong currency is not necessarily beneficial to a country’s economy. In the short term, for example, a weaker dollar means that US goods and services become more attractive to foreign markets, which could provide a boost to the country’s manufacturing industry and other major exporters. There will be concerns, however, that the fall in value is not simply the natural ebb and flow of the currency market, but an indication that the dollar is losing its status as the world’s chosen safe-haven currency. Cline, however, believes that talk of a US dollar collapse is premature. And yet, some analysts are worried. Further uncertainty is scheduled for February next year, when Federal Reserve Chair Janet Yellen steps down, and ongoing international tensions show little sign of abating. Could continual decline indicate a long-term lack of confidence in the dollar? 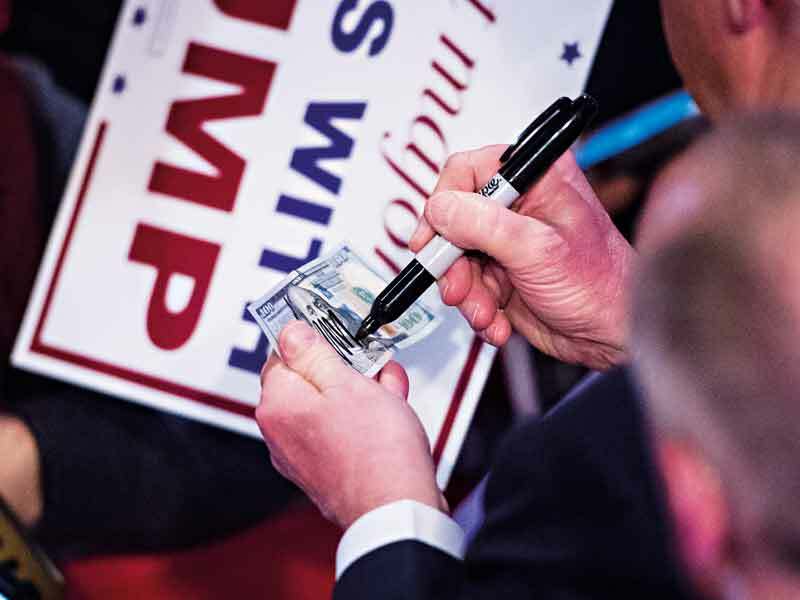 History would suggest not – the dollar has been in worse positions than this and recovered – but with a political outsider like Donald Trump in office, maybe history doesn’t quite count for as much as it used to.